– Heat the oven to gas mark 4/180C and line 3 baking trays. – Put the flour and butter, chopped into pieces, in a food processor and blitz until it looks like breadcrumbs. – Add the sugar and lemon zest and blitz until mixed in. – Add the egg yolks and blend until it comes together to form a dough. – Tip out onto a worksurface and bring together with your hands into a smooth ball. – Roll out the dough on a well floured worsurface to a thickness of about 5mm. You may need to split the dough into smaller amounts to roll it out. – Place on a baking tray and bake for 10 minutes until just golden. I find it best to cut out a tray of biscuits and while one is in the oven have the next resting in the fridge. – Sandwich two biscuits with a teaspoon of lemon curd in the middle and gently press together. – Mix together the icing sugar and enough lemon juice to form a runny drizzle. Place it in a sandwich bag and snip the corner off. 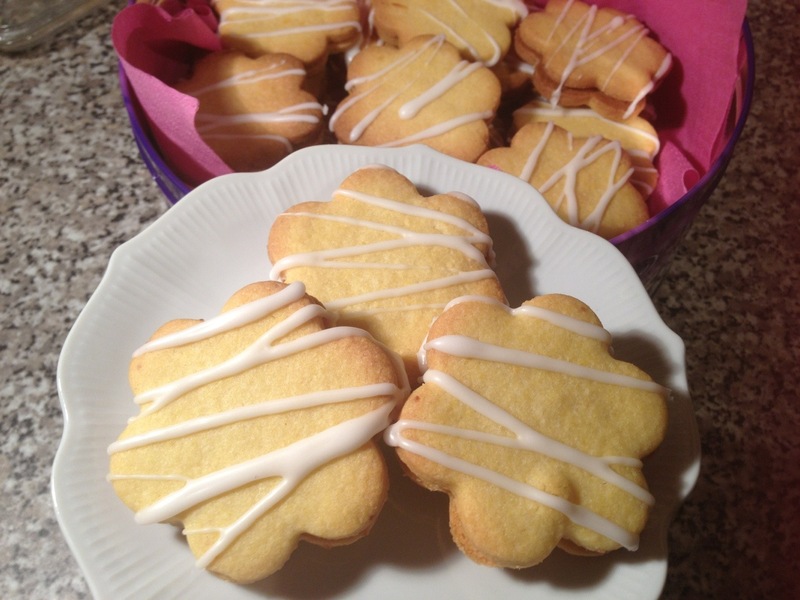 – Place the biscuits on trays and drizzle the icing back and forth over the biscuits. – Leave the icing to dry before packing away in a tin.